Describing Gordon Burford's Australian made model aero engines and his manufacturing business, well known during the years of popularity of control line in Australia. 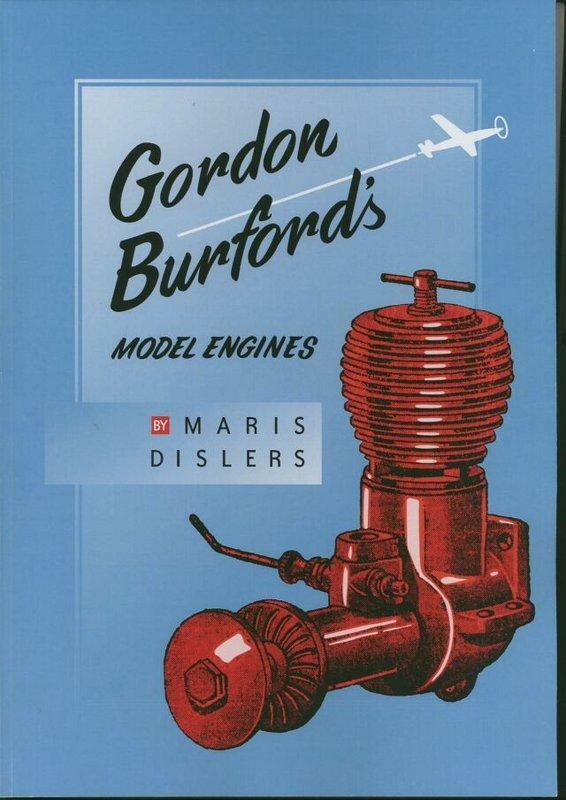 Gordon Burford was not the only one to manufacture model aircraft engines in Australia, but he was certainly the most persistant and successful. He produced a bewildering variety of engines, starting in 1947 and retiring in 1974, selling engines under the names Gee Bee, Sabre, Glo Chief, and Taipan. Gordon was born in Adelaide in 1919 and built his first model aeroplane at the age of 10. By the arrival of the second world war he had trained as an aircraft instrument fitter, an occupation that kept him busy during the war years. After the war ended, importation into Australia of luxury goods (such as model engines) was severely restricted, a situation that resulted in Gordon developing the idea of manufacturing his own engines. Around 1946 he bought a Hercus lathe and used it to make 3 engines based on the English Sparey 5cc diesel. Working from a backyard factory at his home in Surrey Street, Grange, equipped with his Hercus lathe, a Hercus tool and cutter grinder, and a Sunnen hone, Gordon produced his first production engine in 1947. It was a 5cc fixed compression diesel based on the American Drone and marketed as the Stuntmota. 1. Control line flying during its early years became one of Gordon's interests. He was a regular attender at contests held at Colley Reserve in Glenelg for several years, and developed a design for an aerobatic biplane called the Wombat, ideal for Stuntmota power. 2. A more original family of engines sharing a common crankcase casting became Gordon's second production effort. It consisted of a variable compression 5cc diesel (GB50), a glow plug version (GB50G), and 7.5cc glow plug engine (GB75), as described in the Myer Emporium advertisement of 1950. Total combined production of all three engines was about 400, and they were marketed under the Gee Bee name by Gordon's friend Bill Evans. Bill ran Model Aircraft Industries in Glenelg and published Australia's first aeromodelling magazine, Australian Model Hobbies. 3. A picture of the glow plug GB75, which was followed by the GB 250 of 1950, a variable compression, 2.5cc diesel. It was around this time that Gordon had a serious disagreement with Bill Evans and decided to discontinue using the name Gee Bee for all his engines. The name Sabre was chosen. This was at the beginning of what is now recognized as the golden era of control line in Australia, so it seemed likely there would be a good demand for Gordon's engines and the prospects for his fledgling business looked good. 4. Probably the first of the Sabre glowplug engines was the 49, similar to the one pictured here. It came supplied with a KLG brass topped glowplug. The Sabre 49 was an engine equipped with two piston rings, first rising to prominence at the 1951/52 Nationals in class 3 teamrace where one placed second. Also seen at the 1951/52 Nationals were a dozen Sabre 150 diesels intended for free flight, and sold by Gordon to his fellow competitors. Now might be a good time to mention that many of the engines pictured in this article have been restored to near-new appearance to become collector's items. Sticklers for authenticity will be able to point out where non-original nuts and washers have been used, or where needle valve assemblies from later Burford engines have been substituted for originals no longer available. Hopefully, these minor deviations from absolute authenticity will not spoil your enjoyment of the story. 5. The Sabre 19 pictured here became one of Gordon's more successful engines. It was a modified copy of the American K&B 19. First produced in 1953, it was reviewed in Model Aircraft magazine of March 1954. Control line competition rules did not favour .19 cubic inch engines around that time, but for sports flying the Sabre 19's were greatly appreciated by those who bought them. Only Sabre 49's 19's and Mk 1 29's were stamped with a serial number. These were assigned sequentially as orders were dispatched — in no particular order of engine size. That is — there are no duplicate numbers between engines of different capacities. Serial No 755 is the highest known for a Sabre 49. Production of 19's & 29's continued after that, with the highest known serial number of 1692 on a Sabre Mk 1 29. That's a production of around 1700 total for 49, 19 and Mk 1 29 Sabres. 7. Meanwhile, as mentioned earlier, Gordon Burford started producing 2.5cc diesel engines as early as 1950. He developed these through several variants, models, series, or marks (call them what you will) before arriving at the green head variant of about 1954 pictured here. Hearns Hobbies Sabre Trainer model aircraft was named after these engines, producing a combination with which numerous Australian boys learned to fly. So by the mid nineteen fifties a comprehensive range of successful Sabre engines was in production. Business was good. It was about this time that competition from imported Japanese engines started to be noticed in earnest. In April 1952 Gordon Burford had applied for official recognition of the name Sabre as his trademark. By the end of 1955 his application was still languishing awaiting approval, bogged down by government red tape whilst engines branded Sabre were being sold in thousands. But in February 1956 Gordon received a letter from lawyers representing North American Aviation Inc demanding that he withdraw his application to use the trademark Sabre, and give an undertaking not to use the trademark again! North American Aviation were the producers of the Sabre jet fighter aircraft made under licence in Australia by Commonwealth Aircraft Corporation, but no evidence was produced to prove that either of these businesses had ever used the name Sabre before Gordon. Furthermore, Gordon's trademark application had been classified in the 'Toys & Sporting Goods' category, a category unlikely to be confused by anyone as having anything to do with full sized aviation. Gordon's lawyers assured him he would win any resulting legal battle, but Gordon was not prepared to pay the likely legal cost. He stopped using the name Sabre for his engines, leaving them unbranded for a while whilst a new name was invented. Order your copy direct from the author by responding to his advert here. Developed 2009 by David Kidd. Your Webmaster is Ron Chernich.